A brow lift elevates the eyebrow into a more youthful position and decreases the bagginess of the upper eyelid. In many cases it can reduce wrinkles and deep furrows of the forehead. There are many ways to do a brow lift. In most cases I use a limited incision technique with a small scar next to the hair line. Under local anaesthetic the deep tissues are lifted into a higher position and securely fixed to the skull. The limited incision brow lift technique is modified from that described by David Knize from Colorado. Other techniques include endoscopic lifts, open brow lifts and direct incisions above the brow. Any of these techniques can be used if the situation is appropriate. A brow lift can be done together with upper eyelid blepharoplasty and facelift surgery if desired. Can a brow lift be done under local anaesthetic? In some cases with marked wrinkling of the forehead, a brow lift can be done under local anaesthetic with a longer incision next to the hairline (pretrichial incision). The surgery is in a more superficial plane. However my usual technique uses a deeper plane that requires a general anaesthetic. The cost of a brow lift varies depending on whether local or general anaesthetic is used. For the current fixed costs please either email us or phone us on 0800 268 526. The quoted cost for surgery covers everything including theatre fees, consumables and all the follow up for dressings and checks in the first year after surgery. This cost includes GST. Can I see examples of Charles Davis brow lift surgery? 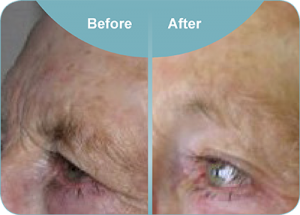 Examples of brow lifts performed by Dr Davis are shown during a consultation to illustrate the typical range of results, the limitations of surgery and the placement of the scar. Are there other considerations when doing a brow lift? It is possible to remove too much upper eyelid skin if a blepharoplasty is done in someone who really needs a brow lift. If the brow is lifted later the upper eyelids may be pulled up exposing the eye. Surgeons should not elevate the lateral part of the brow too much as this can lead to a “surprised” look. It is important that the hairline is not pulled too far backwards. I avoid this by using an “pretrichial” hairline incision when this is appropriate. The frontal branch of the facial nerve (which makes the upper frown muscles work) can be damaged when stopping bleeding from the so-called sentinel vein and will paralyze one half of the forehead. The central frown muscles (corrugators) often treated with Botox. Their anatomy is quite complicated however the central segment can be removed during an open brow lift.